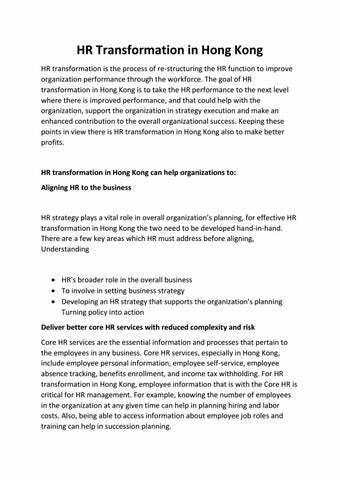 HR Transformation in Hong Kong HR transformation is the process of re-structuring the HR function to improve organization performance through the workforce. The goal of HR transformation in Hong Kong is to take the HR performance to the next level where there is improved performance, and that could help with the organization, support the organization in strategy execution and make an enhanced contribution to the overall organizational success. Keeping these points in view there is HR transformation in Hong Kong also to make better profits.  HR's broader role in the overall business  To involve in setting business strategy  Developing an HR strategy that supports the organization's planning Turning policy into action Deliver better core HR services with reduced complexity and risk Core HR services are the essential information and processes that pertain to the employees in any business. Core HR services, especially in Hong Kong, include employee personal information, employee self-service, employee absence tracking, benefits enrollment, and income tax withholding. For HR transformation in Hong Kong, employee information that is with the Core HR is critical for HR management. For example, knowing the number of employees in the organization at any given time can help in planning hiring and labor costs. Also, being able to access information about employee job roles and training can help in succession planning. Understanding the business strategy will help in supporting broader goals of business by HR management. This helps in developing action plans that convert policies into executable operations. This helps in monitoring how well the employees are pursuing their objectives, and also to ensure activities continue to reflect the overall business and personal goals. HR transformation in Hong Kong must inspire the employees to embrace the change by enabling them to challenge existing strengths in a safe domain. Creating opportunities like workshop and training will help in developing their capabilities and thereby enhanced employee engagement, exposing employees to the fascinating things they can do with AI and give them a chance to think differently. The future HR transformation will make extraordinary challenges for HR experts as it will be the blend of AI and augmented reality. This requires both employees and innovation to prepare the employees to work at anytime and anywhere. HR transformation is the process of re-structuring the HR function to improve organization performance through the workforce.